Eta Carinae is an intriguing double star system that contains one of the biggest and brightest stars in the Milky Way. X-rays from Eta Carinae give clues about the system, including how the winds from the stars interact. Astronomers have been observing Eta Carinae with Chandra since the telescope was launched in 1999. The Eta Carinae star system does not lack for superlatives. Not only does it contain one of the biggest and brightest stars in our galaxy, weighing at least 90 times the mass of the Sun, it is also extremely volatile and is expected to have at least one supernova explosion in the future. As one of the first objects observed by NASA's Chandra X-ray Observatory after its launch some 15 years ago, this double star system continues to reveal new clues about its nature through the X-rays it generates. Astronomers reported extremely volatile behavior from Eta Carinae in the 19th century, when it became very bright for two decades, outshining nearly every star in the entire sky. This event became known as the "Great Eruption." Data from modern telescopes reveal that Eta Carinae threw off about ten times the Sun's mass during that time. Surprisingly, the star survived this tumultuous expulsion of material, adding "extremely hardy" to its list of attributes. Today, astronomers are trying to learn more about the two stars in the Eta Carinae system and how they interact with each other. The heavier of the two stars is quickly losing mass through wind streaming away from its surface at over a million miles per hour. While not the giant purge of the Great Eruption, this star is still losing mass at a very high rate that will add up to the Sun's mass in about a millennium. Though smaller than its partner, the companion star in Eta Carinae is also massive, weighing in at about 30 times the mass of the Sun. It is losing matter at a rate that is about a hundred times lower than its partner, but still a prodigious weight loss compared to most other stars. The companion star beats the bigger star in wind speed, with its wind clocking in almost ten times faster. When these two speedy and powerful winds collide, they form a bow shock - similar to the sonic boom from a supersonic airplane - that then heats the gas between the stars. The temperature of the gas reaches about ten million degrees, producing X-rays that Chandra detects. The Chandra image of Eta Carinae shows low energy X-rays in red, medium energy X-rays in green, and high energy X-rays in blue. Most of the emission comes from low and high energy X-rays. The blue point source is generated by the colliding winds, and the diffuse blue emission is produced when the material that was purged during the Great Eruption reflects these X-rays. The low energy X-rays further out show where the winds from the two stars, or perhaps material from the Great Eruption, are striking surrounding material. This surrounding material might consist of gas that was ejected before the Great Eruption. An interesting feature of the Eta Carinae system is that the two stars travel around each other along highly elliptical paths during their five-and-a-half-year long orbit. Depending on where each star is on its oval-shaped trajectory, the distance between the two stars changes by a factor of twenty. These oval-shaped trajectories give astronomers a chance to study what happens to the winds from these stars when they collide at different distances from one another. Throughout most of the system's orbit, the X-rays are stronger at the apex, the region where the winds collide head-on. However, when the two stars are at their closest during their orbit (a point that astronomers call "periastron"), the X-ray emission dips unexpectedly. To understand the cause of this dip, astronomers observed Eta Carinae with Chandra at periastron in early 2009. 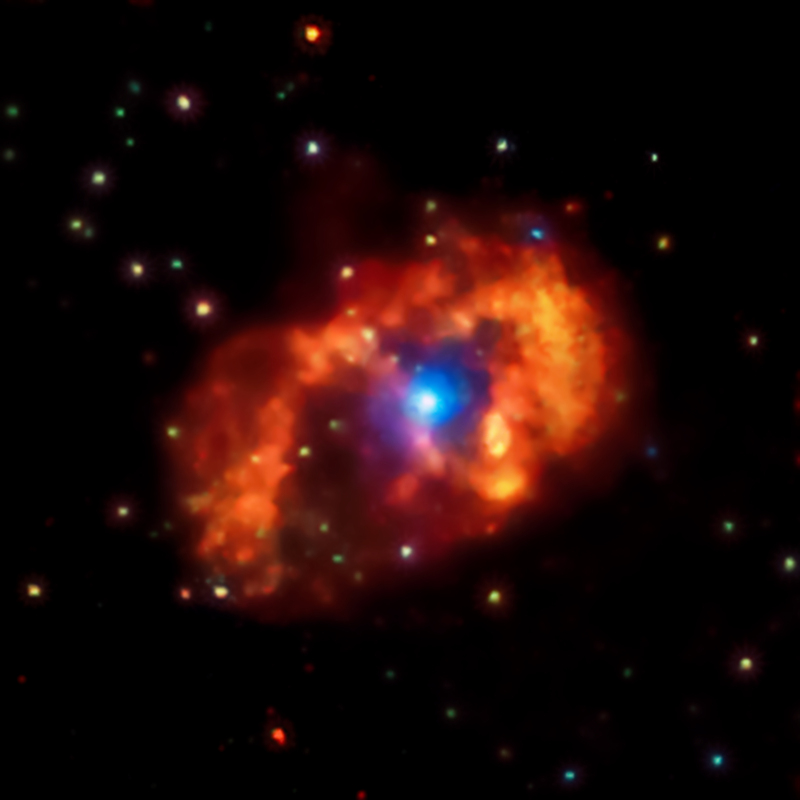 The results provided the first detailed picture of X-ray emission from the colliding winds in Eta Carinae. The study suggests that part of the reason for the dip at periastron is that X-rays from the apex are blocked by the dense wind from the more massive star in Eta Carinae, or perhaps by the surface of the star itself. Another factor responsible for the X-ray dip is that the shock wave appears to be disrupted near periastron, possibly because of faster cooling of the gas due to increased density, and/or a decrease in the strength of the companion star's wind because of extra ultraviolet radiation from the massive star reaching it. Researchers are hoping that Chandra observations of the latest periastron in August 2014 will help them determine the true explanation. These results were published in the April 1, 2014 issue of The Astrophysical Journal and are available online. The first author of the paper is Kenji Hamaguchi of Goddard Space Flight Center in Greenbelt, MD, and his co-authors are Michael Corcoran of Goddard Space Flight Center (GSFC); Christopher Russell of University of Delaware in Newark; A. Pollock from the European Space Agency in Madrid, Spain; Theodore Gull, Mairan Teodoro, and Thomas I. Madura from GSFC; Augusto Damineli from Universidade de Sao Paulo in Sao Paulo, Brazil and Julian Pittard from the University of Leeds in the UK. Coordinates (J2000) RA 10h 45m 04s | Dec -59° 41' 03"
Observation Time 30 hours (1 day 6 hours). Thank you for your efforts in creating this Eta Carinae essay. I have a love for learning all I can about the Universe, how things work, that processes taking place from the very small to the very large. I am often amazed at how you can determent distance from, and size of object, by these types of pictures you have look at. I am 72 and have my own 8 scope but nothing like these pictures compare. Keep up the great work, just wish I could understand more of the process. masssive incredible each to close. which is the distance between them? 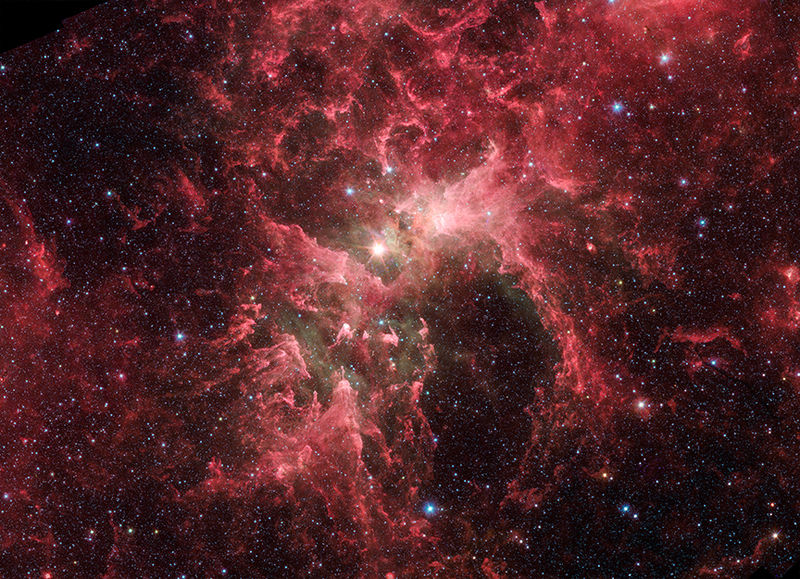 Eta Carinae is another reason why both my physics astronomy students find the universe a fascinating place to study. A double star system that contains one of the largest stars in the Milky Way galaxy. About 7,500 light years from Earth. About 4.6 light years across. In the constellation Carina, mostly Southern Hemisphere, low on the horizon in the Northern Hemisphere.